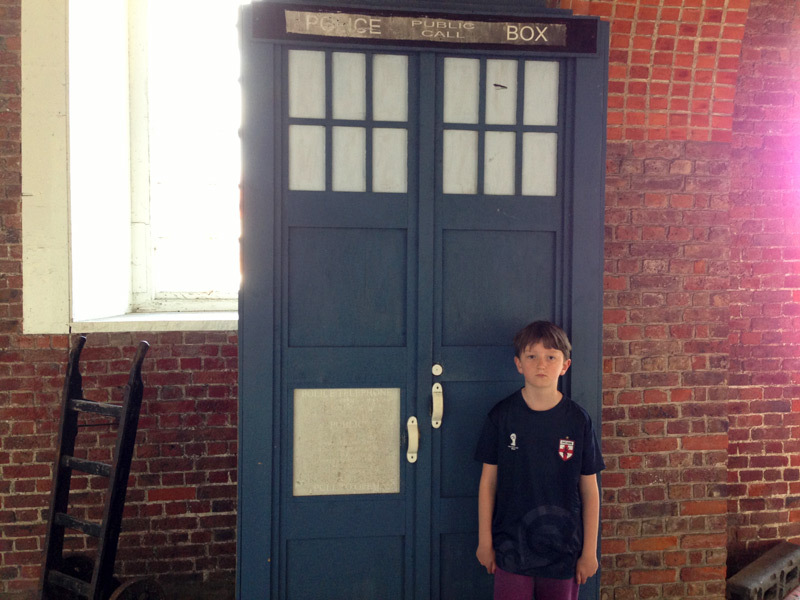 Welcome to the Dunbury Academy TARDIS! 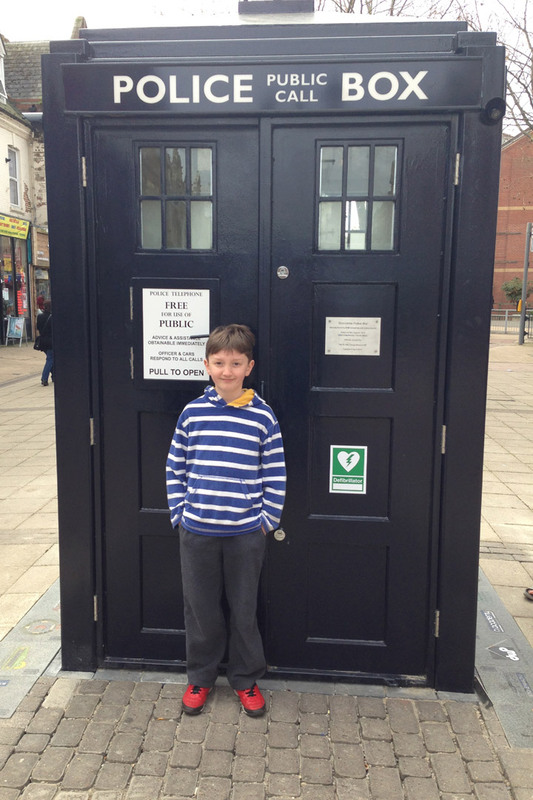 I was given the opportunity to have the day off from my school so that I could visit the TARDIS and I travelled there last week by train and bus. When I arrived at the school I couldn’t help but notice how small it was compared to my own. I felt very welcome and I was immediately greeted by Mr Payne the teacher who made the TARDIS, who invited me to come and have a lesson. On Thursday night Mr Payne was awarded Nursery / Primary Teacher of the Year in the first ever Daily Echo School Awards. Well done Mr Payne! 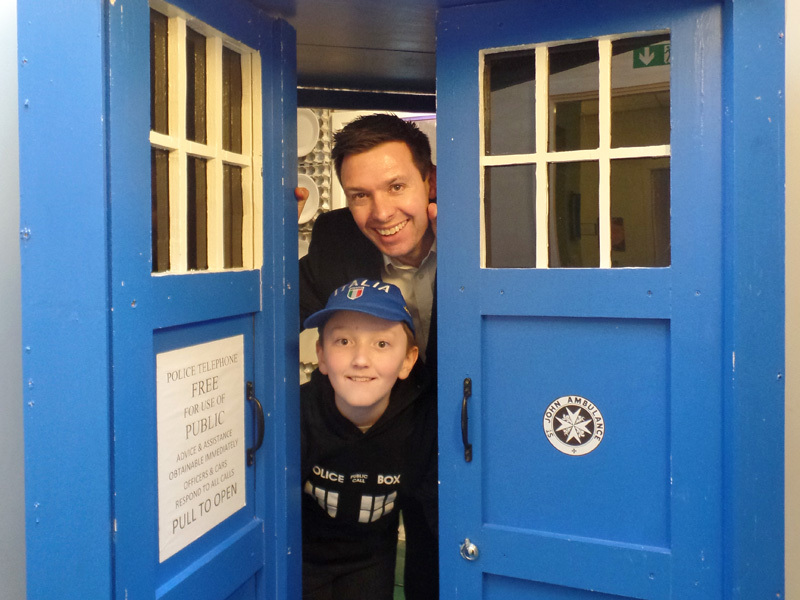 I was greeted by some of the Dunbury students and got taken to the TARDIS which was materialised on the first floor. There was no key but I was allowed to open the door using a Sonic Screwdriver. 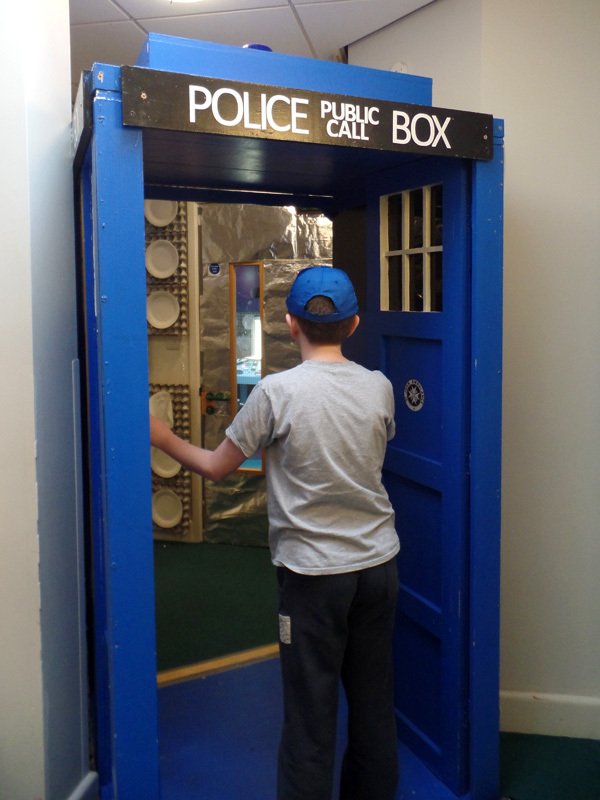 I couldn’t stop saying ‘Wow!’ as I was so surprised – it was bigger than I thought it would be but then again, it is a TARDIS. 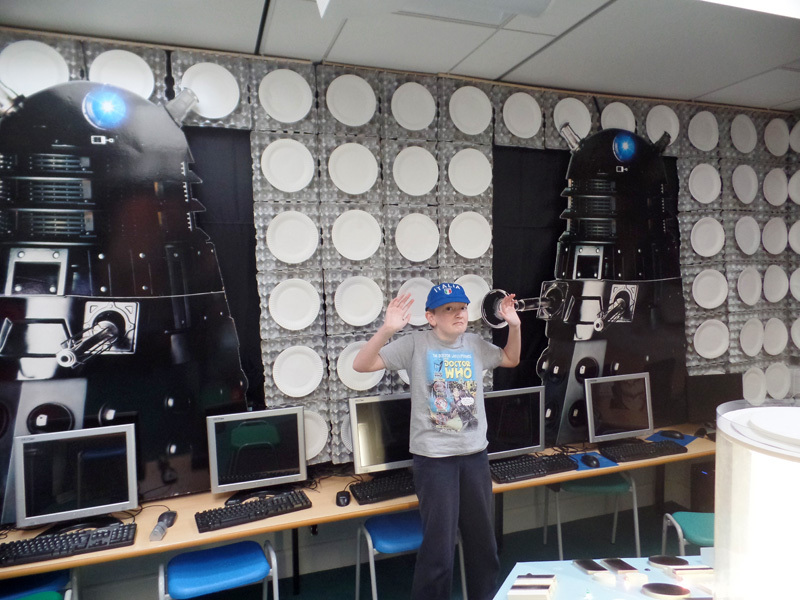 I started exploring but suddenly Daleks appeared on the screen – we were under threat! 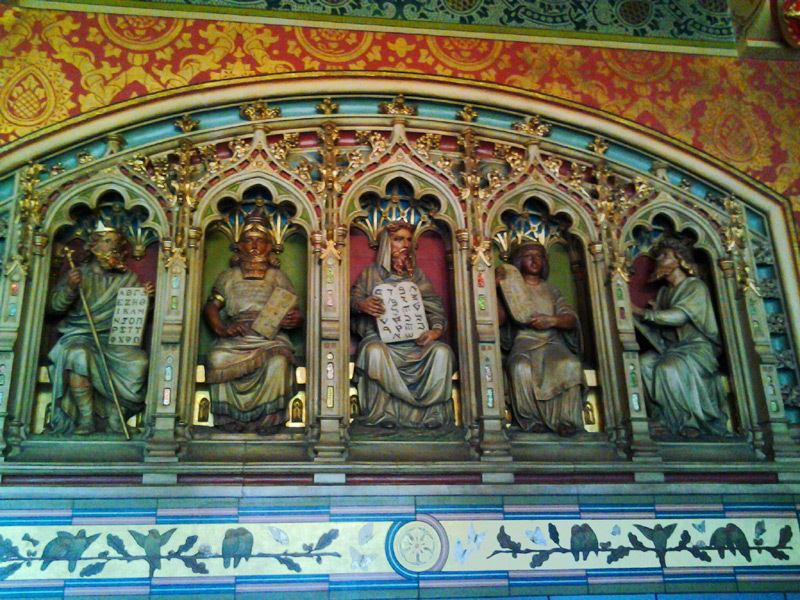 First we had to solve a coded message from Rassilon, the Lord High President of Gallifrey then we travelled around time and space meeting many historic figures. The pupils and I had to solve multiple puzzles to ensure we were safe from the Daleks, including maths, codes, Roman Numerals and Hieroglyphics. First we met Archimedes in 214 BC, then went to Egypt to meet Cleopatra in 69 BC. Next to Rome to meet Julius Caesar in 48 BC who sent us to see the Viking Explorer, Eric the Red, in 991 AD. 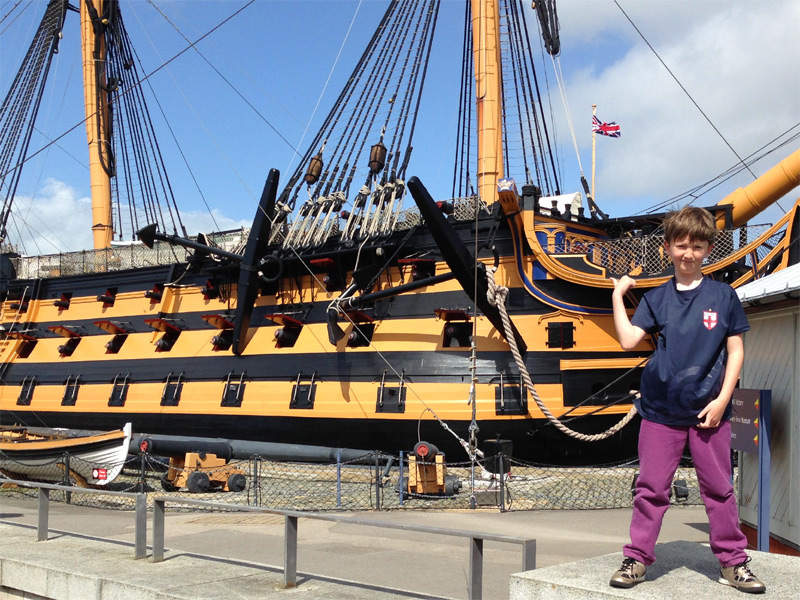 We then went to see William the Conqueror in 1066 AD who sent us on our way to see the Doctor’s old friend (and mine!) Winnie Churchill in 1940. 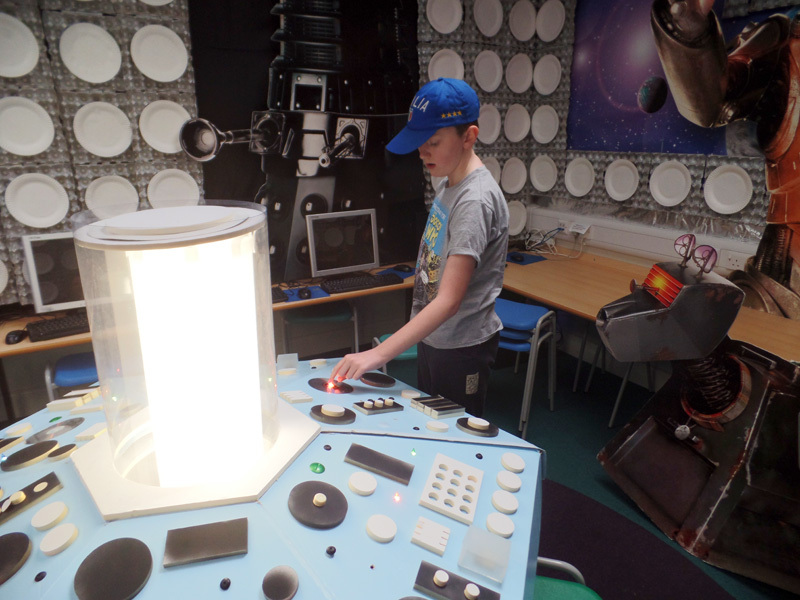 We finally solved the Tablet of Skaro but it was a trap – the Daleks had kidnapped K-9! After some timey-wimey stuff we found him and we were safe from being blown to space smithereens. Yay! Told you we went to Rome! After all that excitement I had some time to interview the children about their time in the TARDIS. I asked them what they thought when they first saw it and immediately two of them said ‘Amazed!’ at exactly the same time. Someone else said ‘Speechless!’. It was built in the school holidays so when they saw it, it was a real surprise. 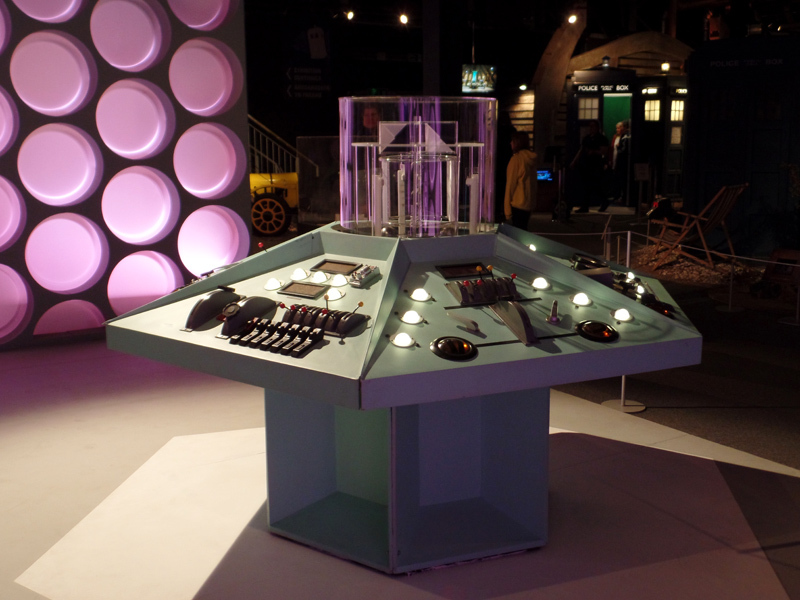 They have learnt all different subjects in the TARDIS but it was built as part of a Space Topic. For English they travelled to space to write a description of a planet. For Maths they have had tests and learnt about Roman Numerals. They have visited the planet Kepler 452B which is 1400 light years away. It would take 26 million years to travel there if you didn’t have a TARDIS. Kepler 452B is 60 % bigger than earth and orbits around a star. Like Earth it is in the Goldilocks Zone which means that there could be life on there. 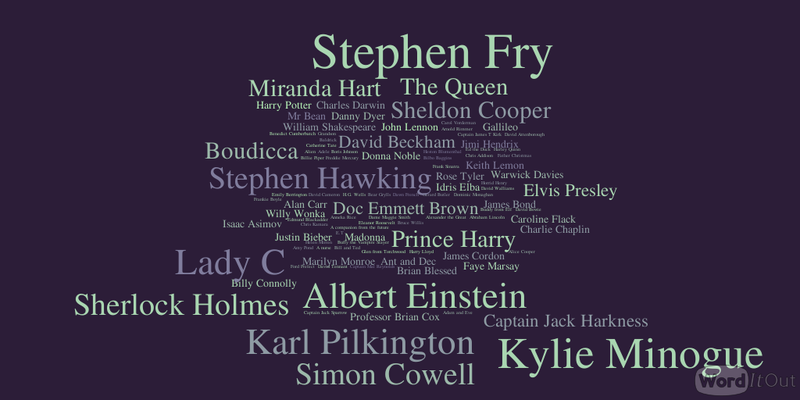 To sum it up – they have learnt A LOT of stuff! I also told the pupils about Project Indigo, especially the filming locations I have visited in Dorset which was a surprise for them. Then it was time for Assembly and I went along to support the school and see how different it was to my school. The classes are named after trees and there were only two at the Winterborne Whitechurch base. Certificates were handed out and pupils were rewarded for their achievements. The new First Aiders got to use their skills to help out the Headmaster Mr Barker. With Mr Payne – look behind me! After assembly it was home time for the pupils and I got to interview Mr Payne. He built the TARDIS because he wants to inspire children and the first time they saw it they flew through the solar system! He has also built Hogwarts and Narnia style classrooms before. Mr Payne has been a fan of Doctor Who since he was three and his favourite Doctor is Tom Baker because he grew up with him. If you need any proof he is dressed as the Fourth Doctor in his first photo! He is also a fan of David Tennant – and if you need any proof of that he did a Magic Show with him once for Children In Need! I asked Mr Payne where he would like to go in time and space and he said he is happy right here, right now. He really likes his class and the school and wouldn’t want to change anything. If Mr Payne had to go somewhere he would choose to see the future. He said to imagine what it would be like for someone waking up after 20 years in a coma. I think it would be very confusing to see new pieces of technology at work, and it would very sad if people in your family had passed away. Mr Payne could design the TARDIS as he was a helicopter designer once. The TARDIS was made in his garage over two weeks – the hardest part was collecting all the egg boxes for the walls, it took him months to get them! A friend of his helped build the console and donated the Doctor Who cardboard cut-outs from work. I asked Mr Payne if the Headmaster Mr Barker was hesitant in saying yes to having a TARDIS at school or was he quick off the bat? 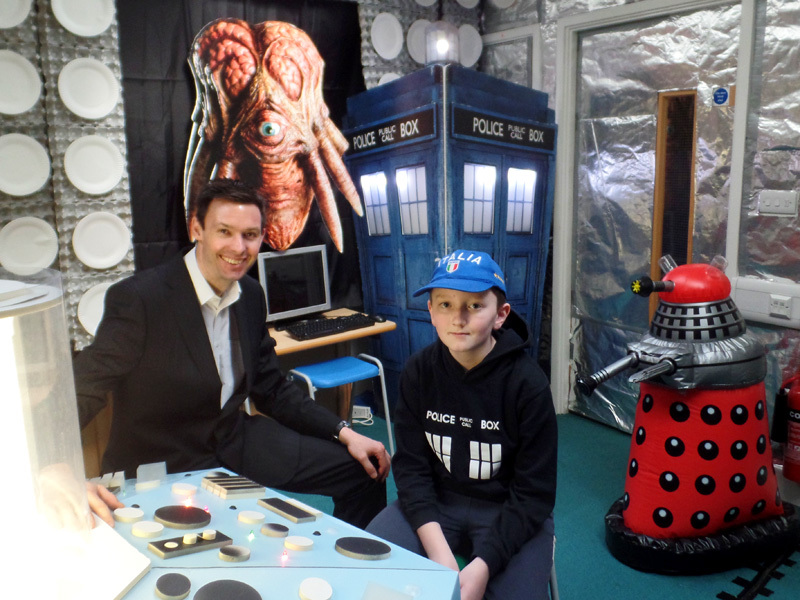 He said that Mr Barker said yes immediately and that the TARDIS has had lots of support from all the staff, parents and children. After I interviewed Mr Payne I had one last go in the TARDIS before I had to leave. 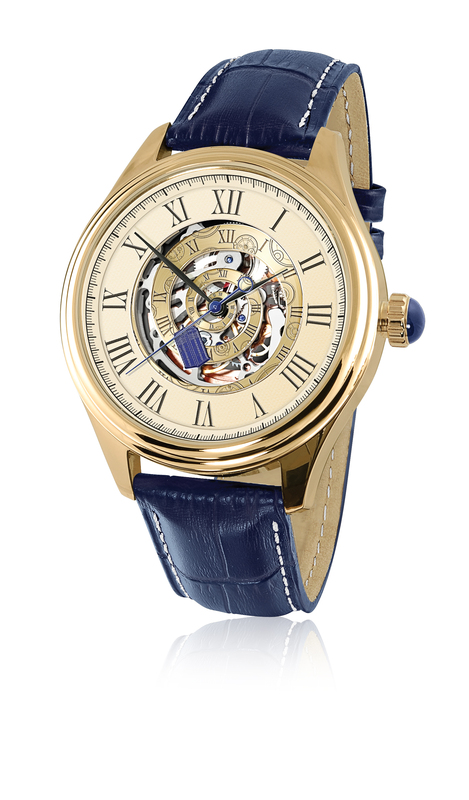 The TARDIS is just Wow! I’d like to say a huge THANK YOU to everyone at Dunbury Academy for their hospitality. I felt so welcome and the staff and pupils were all really nice. It is a very friendly, cheerful school and I had a fantastic day. I hope you enjoyed reading about my time at Dunbury Academy. In a few days something exciting is happening – Project Indigo is turning 2! I hope you will come back and read about my other adventures. Welcome to the Doctor Who Experience! We are travelling back in time to my summer holiday in Wales. 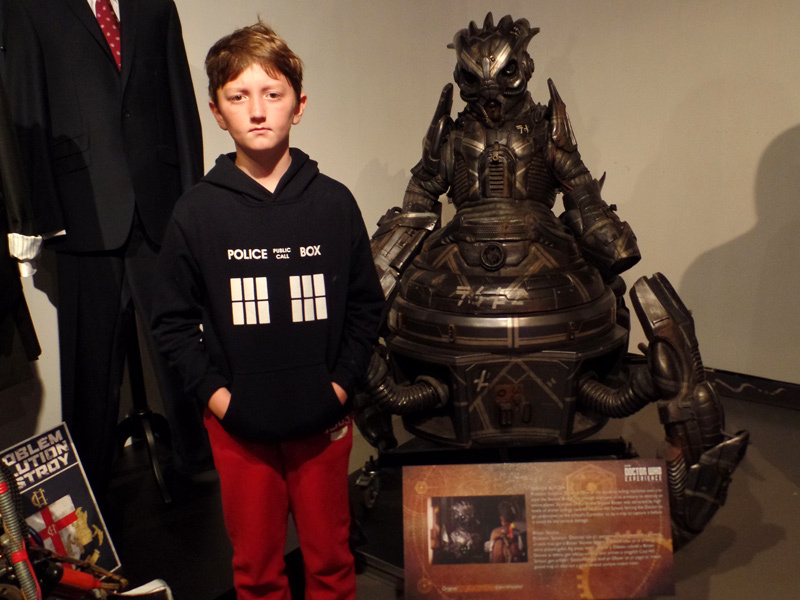 Today we are at the Doctor Who Experience in Cardiff, this time in July 2015. I was very excited to go to The Doctor Who Experience again as it was the first time I had been since it was updated with the new Doctor. In August 2014 I was stood outside the closed Experience whilst Peter Capaldi was inside filming the new interactive story so I was looking forward to seeing the new adventure! When I arrived there was a giant queue as it was the summer holidays and Whovians had come from everywhere to experience the experience! As soon as I arrived I went into the interactive adventure with the other fans. I don’t want to spoil anything for anyone who is planning to go but I will tell you that I entered the Museum of Gallifrey expecting to learn about Timelords and the history of Gallifrey. Instead I embarked on a journey when the Twelfth Doctor transmitted a message saying he needed our help – and we had to grapple with a threat which could destroy the universe…….. It was very exciting helping the Doctor and some of the children were a little scared, but we survived. The Doctor didn’t quite return us to where we started though so I never got to look around the Museum of Gallifrey! Maybe if you visit everything will go a bit smoother for you! After I made it back to Cardiff 2015 I had my photo taken in a green screen TARDIS. I chose to wear a Fez , which was cool, and I chose to be in the Twelfth Doctor’s TARDIS because that is my favourite TARDIS in the history of Doctor Who! I look quite perplexed in my picture because when I was posing in front of the green screen I didn’t know how the background would look. When Peter Capaldi had his photo taken he couldn’t choose so wore the Eleventh Doctor’s Fez and the Fourth Doctor’s scarf! 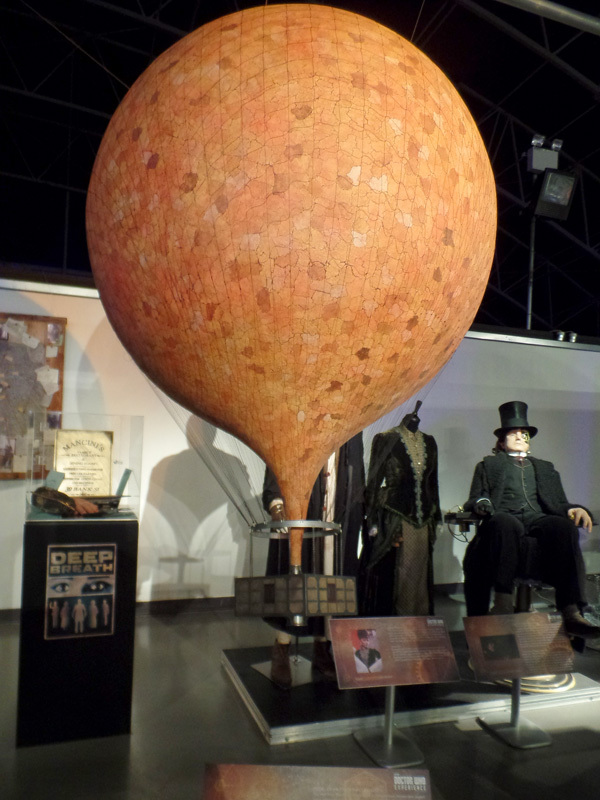 From my favourite New Who story Deep Breath – the hot air balloon made of skin that Half-Face Man tried to escape in. A balloon made from skin! From Mummy on the Orient Express – The Foretold. If you can see him you only have 66 seconds to live! There’s nothing behind me is there? 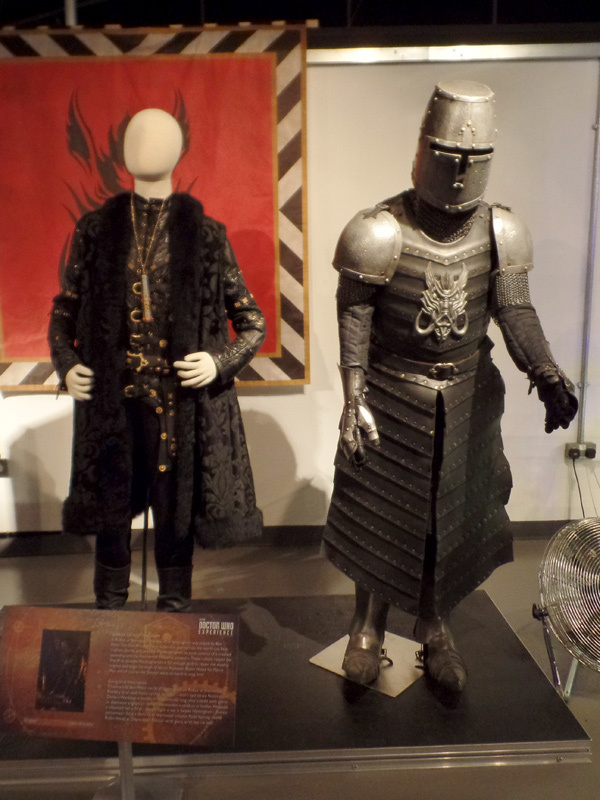 From Robot of Sherwood we can see a knight’s armour and the Sheriff of Nottingham costume worn by Ben Miller. The Sheriff of Nottingham and Robot of Sherwood! From In the Forest of the Night – a lion from Trafalgar Square. This giveaway told the Doctor he was in London and not a forest. A lion from Trafalgar Square! From The Caretaker – the Skovox Blitzer which was a danger to Coal Hill School and one of the most dangerous weapons ever created! I didn’t have enough time in the exhibition because I had to leave Cardiff at lunch time to go to another part of Wales and carry on with my holiday. Sadly for me I had hurt my back too so I couldn’t join in with everything, for example, learning how to walk like a Doctor Who monster. Say something nice, it’s Missy’s costume! Finally I visited The Official Doctor Who Shop. The shop is giant and full of Doctor Who merchandise – it is the only official Doctor Who shop that you can visit in the whole world! Maybe there is one on another planet though..… Anyone can visit this shop; you don’t need to pay for a ticket. I bought a new Doctor Who T-shirt because my old one is getting smaller and smaller by the minute. I will be wearing my T-shirt in lots of future posts, it is in the style of a comic – I hope you will like it. 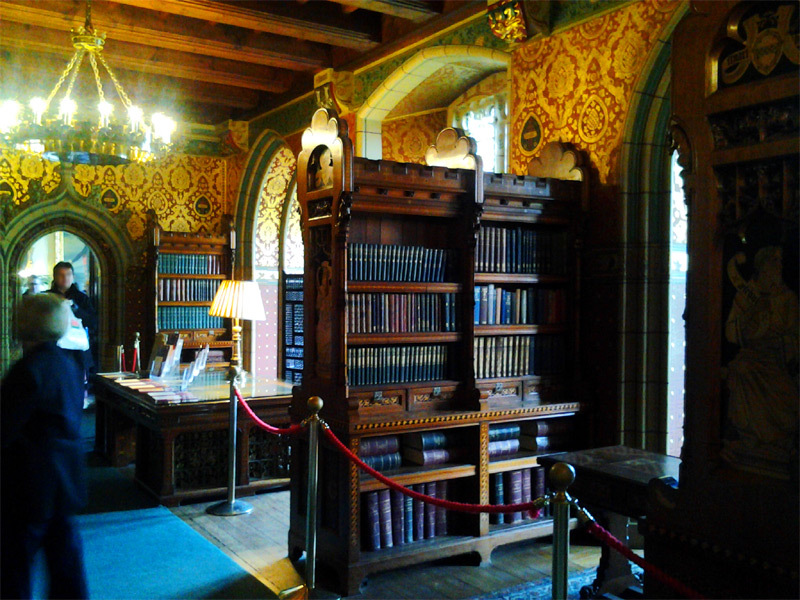 The regenerated experience is better than ever, I’m really glad that I got the chance to visit it before I left Cardiff. 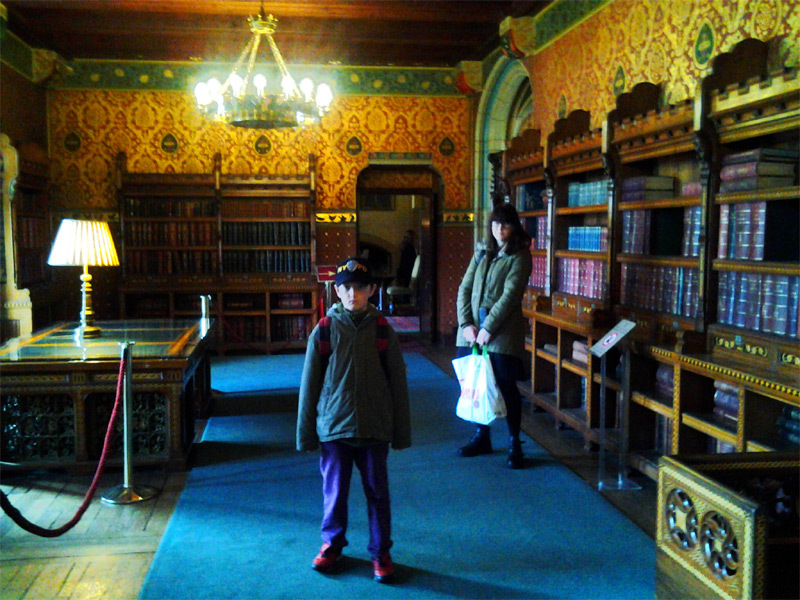 No-one should leave Cardiff without having a Doctor Who adventure. And I’m glad to report that my back is better too! 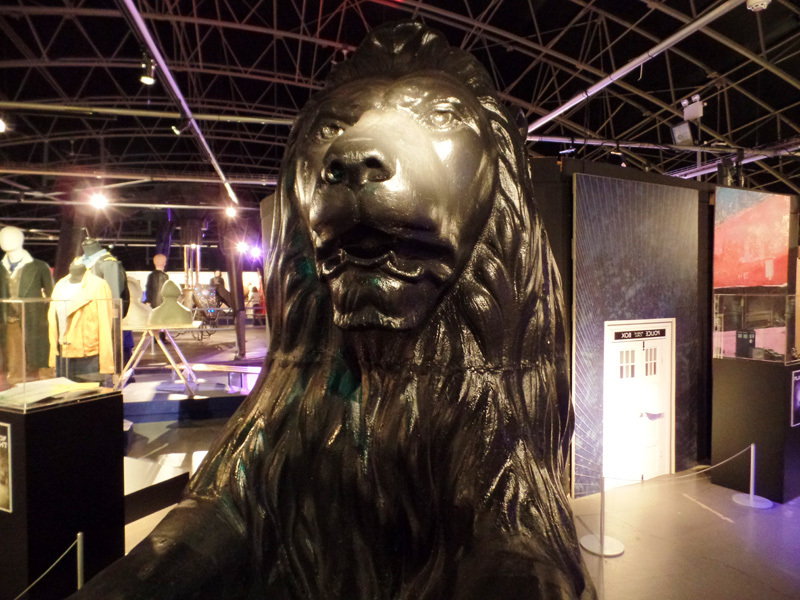 Have you been to the Doctor Who Experience? Please leave a comment and tell me what you think about this amazing Doctor Who attraction. See you soon for a new Doctor Who location report – next time I will be reporting from Mars, I hope you will come back and read all about it. 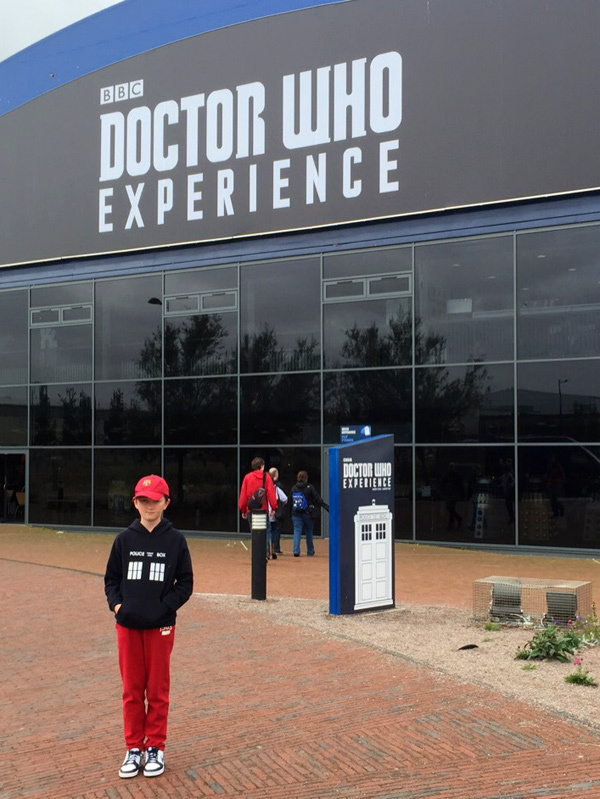 Disclosure: Thank you very much to the Doctor Who Experience for allowing me free entry to report on my adventure. All opinions are my own! 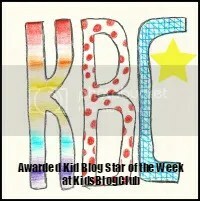 I’m sorry I’m a bit late with my post this week, I have been away with my school and it has been my birthday so I have been tracking a bit off schedule. I shall start by telling you about the lecture I went to this week at Bournemouth University called ‘Life and Death in Doctor Who’. This was part of the University’s Festival of Learning which is a programme of exciting events for local people, now in its second year. I joined the audience which was full of fellow Whovians, all different kinds of people -young, old, men and women, boys and girls. I was the youngest but some people there remembered watching the very first episode when it was broadcast 50 years ago. 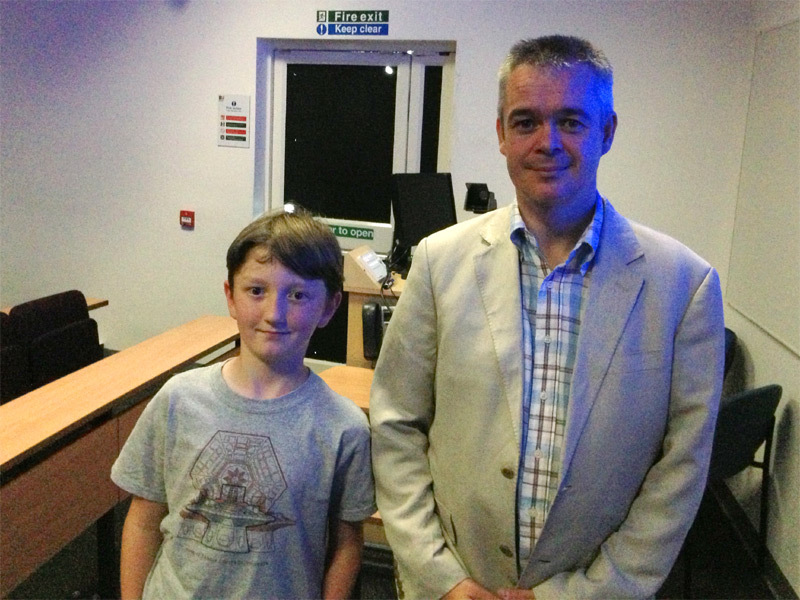 The lecture was given by Professor Iain MacRury who is Head of Research and Knowledge Exchange at Bournemouth University. He is an expert on the Doctor and, along with Michael Rustin, wrote the book The Inner World of Doctor Who: Psychoanalytic Reflections in Time and Space. Phew, that was a bit of a mouthful! The Professor compared the TARDIS to a magic box, and the stories to children’s books such as Alice In Wonderland. He talked about how Doctor Who is about growing up and becoming an adult and showed us clips of the companions to make us understand. One clip showed the Ninth Doctor holding on to Rose’s hand saying he could feel the world spinning. He said the latest Doctors are more caring towards their companions than the old Doctors, and he compared the Fifth Doctor after Adric died to the Tenth Doctor saying goodbye to Rose in Darlig Ulv Stranden. The Fifth Doctor just wanted to cheer his companions up by taking them to the Great Exhibition but the Tenth Doctor visited Rose in a parallel universe and burned up a sun to say goodbye! Afterwards the Professor answered lots of questions from my fellow Whovians, but I was speechless. I met him at the end and he was very kind. Ace called the Seventh Doctor the Professor, maybe that inspired him to become one. Just a quick news flash – I saw yet another blue box! 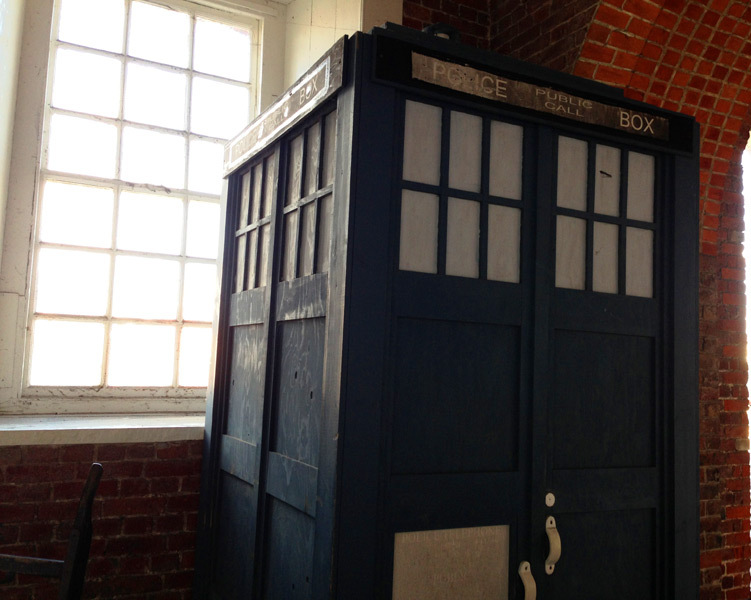 The Professor told me to go to Weymouth House, part of the university and there was a TARDIS in reception. Not mine, I wonder which Doctor had stopped by for the Festival of Learning? I wonder if a future Doctor was in the audience but we didn’t recognise him? It was so cool to be at Bournemouth University in the Media School because Richard Senior, the director of Let’s Kill Hitler, graduated from Bournemouth University in 2002. Maybe one day I’ll direct a Doctor Who episode myself, you never know! See you next week, goodbye.